I remember being a student in London and entering one of the record stores with the largest classical music sections. As soon as I stepped in and walked along the aisles, a feeling of happiness overwhelmed me. The speakers were playing a recording of the Rachmaninov 3rd Piano Concerto — one of my favourite concertos of all time. Not a few seconds had passed, when one of the first climaxes of the first movement was heard in such an ecstatic manner that I was instantly taken over. Who was the pianist with such ferocious playing? Surely one of the old masters, maybe a remastered Horowitz recording newly released? 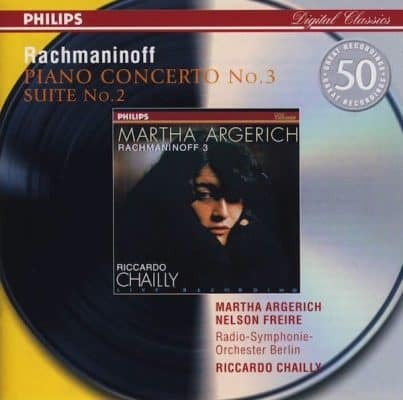 I immediately ran to the cashier in front of the store: Under the “Now Playing” sign Martha Argerich’s CD cover was placed – she looked mesmerising, dressed in black fur, her gaze enigmatic. The CD had just been released and I bought it that very day. Little did I know that this same recording would later become legendary. What is special about this performance? Some people marvel at Argerich’s dazzling tempo. However, this is not reason enough to make a performance of the Rach 3 stand out: speed is not everything. After all, Argerich is close to the composer’s own tempo. It mostly has to do with the Argentinian virtuoso’s expressiveness. She doesn’t just hammer away at the keys, even though I wouldn’t blame the untrained ear if he or she thought so – such is her speed that makes one feel awed. She pays attention to every single phrase, caressing it, her sense of rubato often present. Indeed, her first movement cadenza can be jaw-dropping. However, one needs to listen to her entry in the second movement. It manages to convey a sense of elegant surprise – as unorthodox as this may sound. She plays throughout the Intermezzo with enough poise, without forgetting that this is a virtuosic piece. I haven’t mentioned Chailly’s powerful conducting. 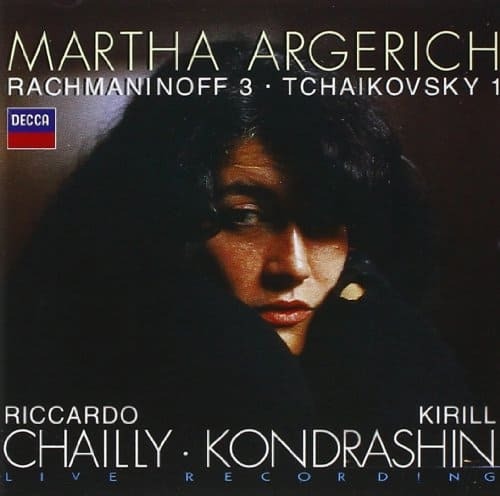 The Berlin Radio Symphony Orchestra manages to follow Argerich’s fleeting pianism, without reducing the orchestra’s power in the tutti, while his softer passages are full of poetry. Indeed, the interaction between soloist and orchestra blends very well in the soundmix without one covering the other. Martha Argerich: fiery piano playing! When one reaches the last movement, one could argue that all hell breaks loose when it comes to Argerich’s unstoppable energy. But to say that would be to undermine the softest passages in the score—and there are many in the last movement—where her lyricism emphasises the Russian nostalgia. The final climax is delivered with a punch and one cannot blame the audience for cheering out that loud. Yes, I have some reservations but they are minor. Usually I prefer the audience applause to be edited out, but this, perhaps, is the only case where I don’t mind. Also, for the perfectionists out there, I could argue that the recorded sound could be slightly better, even though it is nearly excellent as it is. Overall, it is one of the few legendary recordings that totally deserves its praise. I think that the composer himself must have had an overall impression when he composed the piece stating he “composed it for elephants” and that impression surely must fit Argerich’s rendition. Thanks for this enjoyable and interesting review – as someone who is only exploring a wider range of music, including the classics, later in life, I really enjoy your take: both personal and informed. Well done. You have inspired me about the the Rach 3! I recommend all Rachmaninov concertos! There quite a few budget sets available that are excellent!